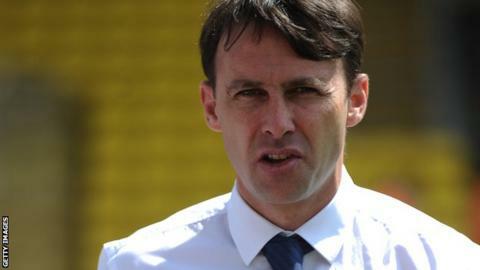 Bolton manager Dougie Freedman has admitted his job has proved more difficult than he expected. Freedman took over in October 2012 and in his first season they missed out on the play-offs on goal difference, but finished 14th last term. This season they have won just once in nine Championship games and Saturday's 2-0 home defeat by Derby saw them slip into the relegation places. "It's proving to be a harder job than I first thought," said the 40-year-old. "We've changed an awful lot off the field, but it's proving to be very difficult on the field. "We're in a difficult moment right now, but I've always felt if you work very hard, then things will come to you. "I understand I'm in charge of, and have the responsibility of, a wonderful football club, and right now we're getting it wrong." Bolton have taken just five points from a possible 27 so far this season. And during the game against Derby, chants of 'Freedman out' and 'Gartside out' were directed at the manager and chairman from the stands. Asked if he expected to be in charge for Bolton's next game against Fulham, Freedman told BBC Radio Manchester: "Yes I do. I don't fear, that's not the way I conduct myself. "I work very hard and I try to put things right and it's proving very difficult. I can understand, I full understand the fans frustration."